The Cry is a duplicitous piece of work that messes with your mind, but will surely keep you guessing. 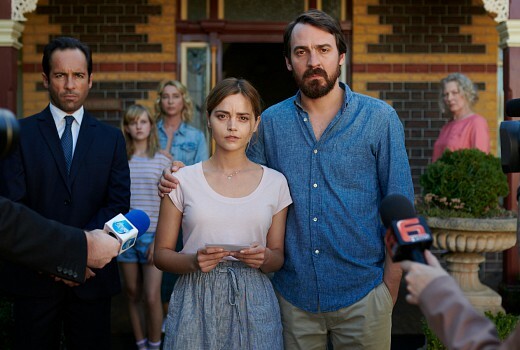 The universe is quite small in this four parter, ricocheting between Joanna (Jenna Coleman) and her husband Alistair (Ewen Leslie), who travel to Australia for a custody battle over teenager Chloe (Markella Kavenagh) with Alistair’s ex-wife Alexandra (Asher Keddie). Told largely from Joanna’s perspective, it transpires over several time periods, from early romance with Alistair to a courtcase in Scotland. Rippling through it all is the catastrophic incident during their visit to Australia. Writer Jacquelin Perske masterfully connects the jigsaw pieces between mystery, emotion, and drama so that you are never quite sure if you are watching a whodunnit or a study in post natal depression. With intrusive cameras and reporters, police interviews and psychologists it isn’t hard to work out, something major has struck this couple and questions abound. Yet the narrative keeps the details at bay even though there is absolute dread in the back of your mind. What is clear is that Alistair’s work as a political spin-doctor in Scotland, and affair with Joanna, led to his marriage break-up with Alexandra, who fled back to the Bellarine Peninsula, west of Melbourne, with Chloe where she has attempted to rebuild her life. But Alistair and Joanna, who now have their own baby Noah, are readying for a custody battle. At the same time Joanna is struggling with motherhood and the long flight to Australia with a crying baby who pushes her to breaking point. In Australia the tug of war escalates, involving Alistair’s mother (Stella Gonet), two detectives (Alex Dimitriades, Shareena Clanton) and a hungry press. Alexandra’s determination to not lose Chloe also sees her cross the line and paints her as a potential suspect in the saga that will unfold. Writer Perske blurs the lines between virtuous and blemished figures artfully teased by director Glendyn Ivin in a backdrop of coastal hues. The dynamic between the hypnotic Coleman, the driven Ewen Leslie and the pained Asher Keddie is what keeps this triangle turning, and at times the turning points are gripping. Make no mistake this requires maximum attention. There are no helpers by way of time stamps to denote flashbacks. Yet for all its horrors and tragic outcomes it stands as a richly rewarding piece of drama. The Cry airs 8:30pm Sunday on ABC. Really great to have this series screened on the ABC. I too wish the series were longer. Jenna Coleman is excellent, as she is playing Queen Victoria in the “Victoria” series. It’s a great cast allround. (i) This is one time where the series may be too short. If it was 6 epsiodes (like most UK series), the psychological aspects of the story and characters may have had a chance to shine more. (ii) If it was made 5-10 years ago, it wouldn’t feel as derivative as it does now. The Missing being the obvious comparison point. (iii) I hope I’m wrong, but I’m dreading Dimitriades entering the scene and playing his usual stoic character. Tcheky Karyo, he is not. The first episode is an incoherent mess. Whatever psychological depth the novel had has been ruined by filming it as a by the book missing child mystery, then cutting it up into small pieces and hitting shuffle play. This destroyed the story, suspense, character and setting as well. After 10 minutes you know everything that is going to happen, except for the inevitable, predictable twist at the end of episode 4. On the brightside I can skip the middle 3.75 hours and use the time to watch some interesting TV, or finish a book. Glad someone else felt the same way as I did…..
Wow ! The first episode was excellent – compelling and so well crafted. I’m well and truly hooked ! Jenna Coleman is absolutely mesmerising in this role. Didn’t think much of her in Doctor Who but loving her performance here. They should have played the first two episodes last night. The first one was so non-linear lots of viewers won’t come back. The second episode asked lots of questions I want to know the answers to. Jenna Coleman is amazing – far and away the best actor to have played a companion on post-2005 Dr Who (Louise Jameson being her classic counterpart).